Weather in February in Khartoum. 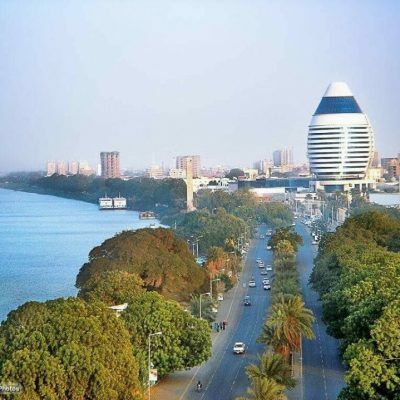 The average temperature in Khartoum in February is fairly hot at 25 °C (77 °F). Afternoons can be very, very hot with average high temperatures reaching 34 °C (93.2 °F). … The weather in February is bone dry with no rain. “Bilad al Sudan” was the name given by medieval Muslims to the belt of African territory south of the Sahara Desert and extending from the Atlantic to the Ethiopian plateau. In its more modern restricted sense, however, ‘the Sudan’ means the Republic of the Sudan, formerly the Anglo-Egyptian Condominium. It covers nearly 1 million square kilometers, an area seven times the size of California and five times the size of Texas, making it the largest single country in Africa. Apart from a narrow plain along the Red Sea, the Sudan is entirely land-locked, sharing boundaries with Egypt and Libya to the north, Ethiopia and Eritrea to the east, South Sudan and Central Africa to the south and southwest, and the Republic of Chad to the west. The Sudan lies wholly within the tropics, and with the exception of the ‘Sudd’ region in the south and some hilly districts towards its western and eastern extremities, constitutes one vast plain. The extreme north is Saharan in its heat and aridity, but below this, a central belt (from about latitudes 18 degrees to about 12 degrees north) contains some of the richest agricultural and grazing land in the country, including the ‘Gezira’ island between the White and the Blue Niles, traditionally the granary of the Sudan. To the south of this belt, the rich grasslands are replaced by thickly forested and intensely humid lands and woods. This climatic diversity enriches the southern region with a variegated flora and fauna. All in all, roughly 20 percent of the land is arable, accounting for 100 million acres, of which only one-fifth is under active cultivation, and that mainly in the northern region. 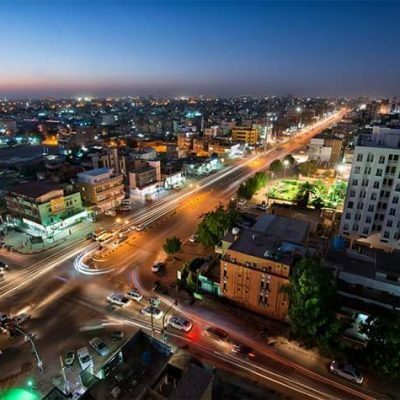 Welcome to Khartoum, the capital city of the Sudan, the largest African country. 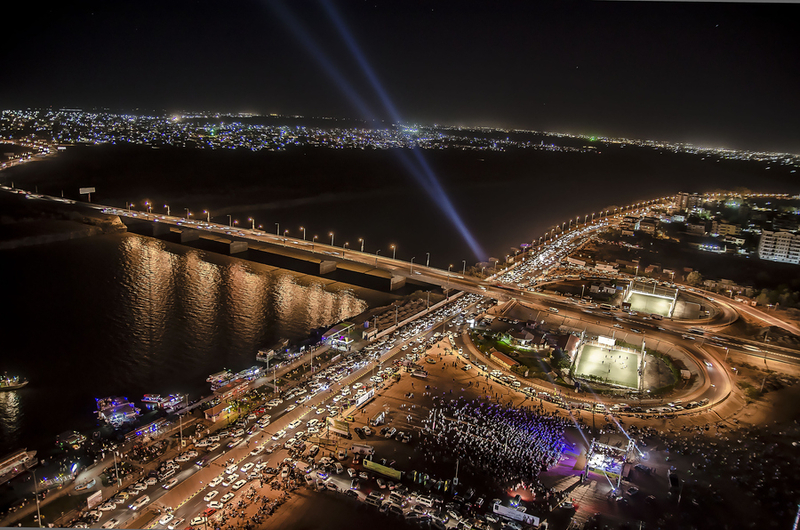 Our cosmopolitan city’s range if historic attractions, museums, free annual events, and tourist services is unrivalled by any other Sudanese city. This visitor map was designed to help you get around the nation’s capital with ease, and to acquaint you with many outstanding sites the city has to offer. Major attractions, transportation system around the city and main roads across the city are noted in the map. We wish you a pleasant stay in the nation’s capital, and hope that you will visit again in the future. 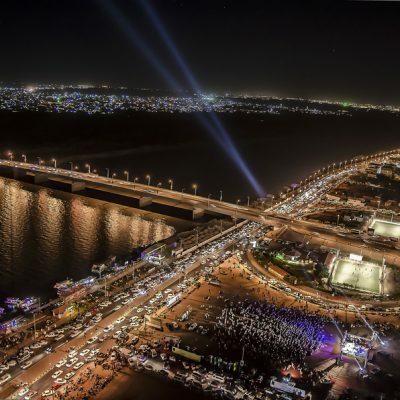 Khartoum town lies along the left bank of the Blue Nile, and forms a huge triangle. 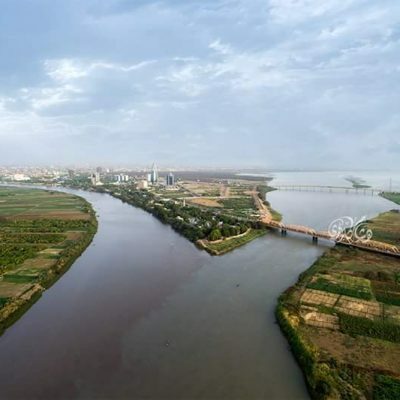 Its vertex at the confluence of then two Niles, the White Nile on its west side and the Blue Nile on its east and the base bordering Gezira State some 30 K. southward. It is situated on latitude 15 36 N, and longitude 31 32 E, and it is 1352 ft. above sea level. Its population has grown to over 5 million people. 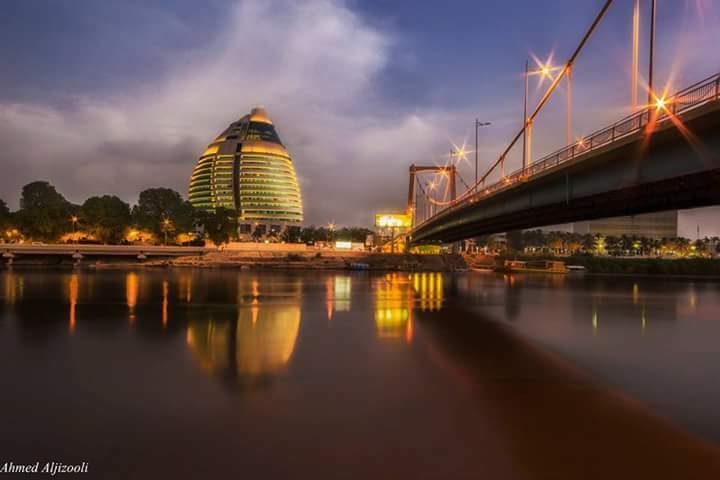 Khartoum, together with the two cities, Omdurman and Khartoum North (Bahri), these cities jointly called the tri-capital, constitute the National Capital of the republic of Sudan. 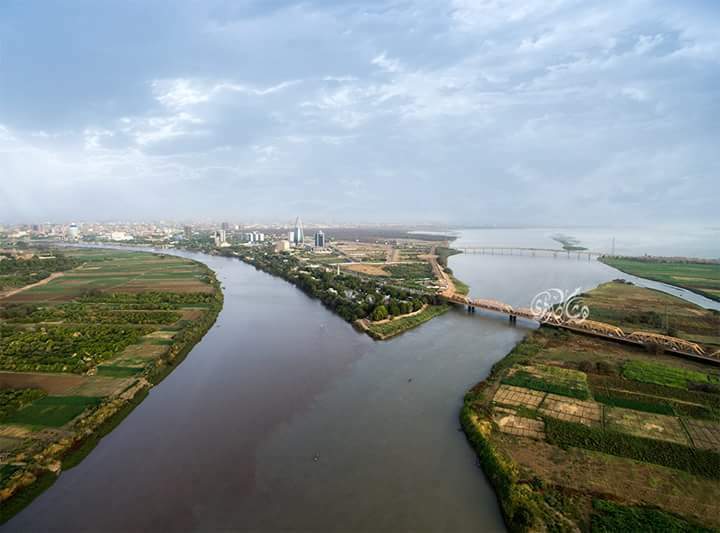 Khartoum Mogran, (confluence of the two Niles) is an outstanding natural attraction to its lovers from all over the globe. The area is famed for migratory birds, frolic flowers and various restaurants as well as a family park. Khartoum is home to several museums, including the Sudan National Museum, The National Museum for Ethnography, Natural History Museum, and the Khalifah House Museum, plus others. They are the must places to visit, as they serve as one stop venues for finding out about the people, culture and history of the largest county in Africa. 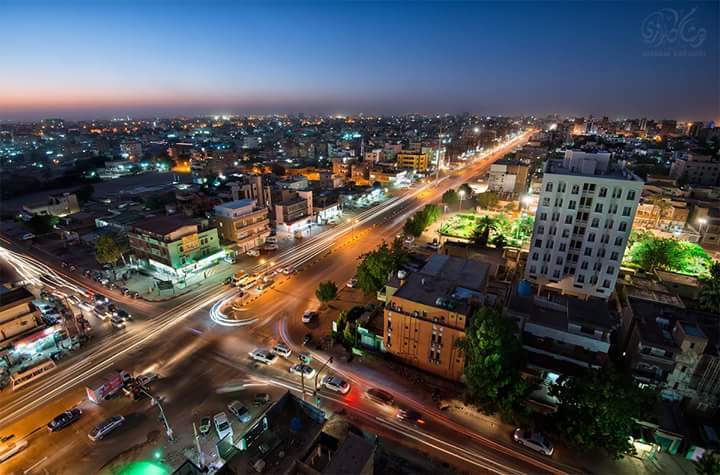 It is located at Omdurman and encompasses and encompasses an important part of the country’s heritage during the Mahdist Era. This ancient Souq exhibits all types of handicrafts, artifacts, souvenirs and various items of Sudanese folk memorabilia. The market is usually open from 8:00 a.m. and closes at sunset. On the western side of Omdurman on Fridays, many dervishes congregate dancing their famous and well-known rites and songs. The practice exemplifies tradition of Sufi in the Sudan. It lies just off shore of the Abu Raouf quarter of Omdurman, on the western side of the Nile, where we can see the manufacturing of traditional boats, the way it have been done for centuries. However, the above are not the only to be seen. 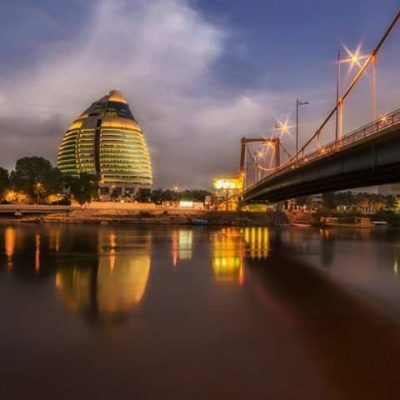 Khartoum is rich with other attractions that are really breath taking. Among them we may include: – Nuba wrestling, the Camel Market, Abd-el-Qayum Gate, the Nile’s Islands, the WWII cemeteries, the church of St. Matthew, king Farouqe’s mosque, Sayyid Ali’s mosque, the Republican Palace, the Botanical Gardens, west Omdurman’s desert and Jebel Awlia, etc. 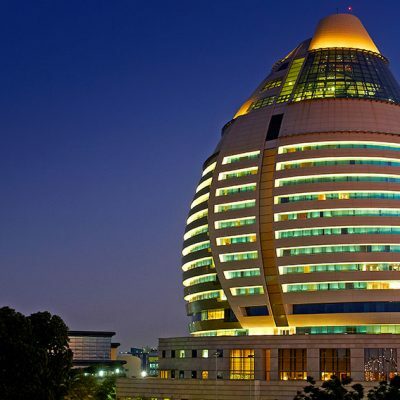 Hotels are found mainly in Khartoum, and are found in all categories. They are well equipped to extend their services from 5 stars grade and down to 2 stars. The majority of these hotels are located in Khartoum. There are plenty of available rooms at all classes throughout the year. 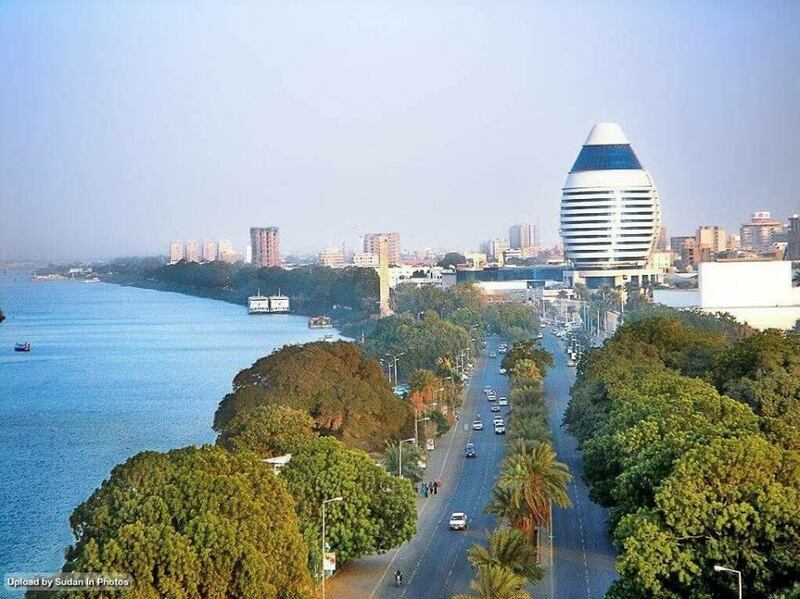 Although the water in hotels and camps in Khartoum is generally suitable for drinking, we advise our visitors to drink mineral water as a precaution for their health – mineral water is now found almost every where a visitor goes to. Most types of meals and internationally known dishes are available in Khartoum. All sorts of fresh meats (chicken, beef, lamb and fish) are slaughtered or caught daily. Fresh vegetables (picked daily) are plentiful. Fruit is from local sources. There are a variety of canned and packaged goods. Hotels and restaurants serve mostly standard fare of both the Sudanese and international types. Light cotton clothing is advisable for Khartoum during the summer days. During the winter days, a pullover is usually sufficient as additional wear. During winter evenings and early mornings, heavier clothing may be necessary. Generally speaking, a layered style wardrobe works best. A foreigner intending to visit KRT could obtain an entry visa from the Sudanese diplomatic missions abroad, or he could get one at KRT International Airport with a prior arrangement with the Ministry of Foreign Relations, if there is no mission in his/her country. Vaccination against smallpox, yellow fever, typhoid and cholera may be compulsory for foreigners upon entry. Prophylactics against malaria are advised. All personal belongings are customs free, with an allowance of 200 r less cigarettes or ¼ ounce of tobacco. As for electrical or electronic equipment and firearms, dues are taken for these items while subject to refund if they are re-exported within 6 months period from the date of their entry. The official local unit of a currency is the Sudanese Pounds. As for foreign currency, there is no limit to the amount currency that could be admitted in Sudan. Declaring these amounts on the port en entry to the authorities is a must to ensure the right of the visitor to take back any amount of foreign currency not exceeding the declared amount. Since the prices of foreign currencies in Sudan are subject to frequent changes, visitors are advised to know these prices before coming to Sudan. Credit cards are not acceptable in most places except some of the International Hotels and Airlines. Greenwich +3 summer timing, Greenwich +2 winter timing. Government offices are open from 8 a.m. to 2 p.m. Banks are open from 8 a.m. to noon. Friday is the official weekly holiday. Arabic is the official language. English is widely spoken (in most hotels and official offices). Islam is the official religion of the majority with Christianity having a special place. There are several means of transport inside Khartoum. The most common transport is the “hafla” or minibus. Similar to the minibus are flat bed conversions that resemble minibuses. There are also some new microbuses that are quite comfortable, as well as taxi, and “rickshaws” services. The museum is situated in El fasher Town in northern Darfur State in the west of Sudan. It accommodates an impressive collection of archaeological items that traces the region history since ancient tomes. Special attention is given to Sultan Ali Dinar”s outlandish belonging and household. This museum is located on the Gama:A Street, opposite to the main building of the University of Khartoum. It was established during the second decade of this century and is relegated to the Faculty of Science. The museum demonstrates interesting and unique species of animals and birds found in Sudan. A collection of mummified reptiles; birds and animals are also exhibited. The museum opens to visitors daily from 8:30 a.m. to 6 p.m., except on Monday. This museum is located in Elobeid Town in northern Kordofan State. The name Sheikan is Derived from a site near Elobeid, where the Mahdist forces vanquished a large British force at a battle in 1880. The museum was initiated in 1965 and holds a substantial number of historic and ethnographic elements that reflect the various stages of Kordofan history. Moreover, the museum exhibits archaeological artifacts from early Stone Age (Paleolithic) to the Funj Islamic era (1505-1820). The museum also displays some interesting relics and items from the Sheikan battle. The museum opens to visitors daily from 8:30 a.m., except on Mondays. The museum was established in 1956 and is situated at the junction of Gam”a Street and ElMek Nimir Street. It enfolds a spectacular collection of material culture of various Sudanese tribes and peoples. This rich heritage of agricultural and nomadic appliances, domestic tools, ceremonial paraphernalia and utilities are artistically exhibited and Knowingly demonstrated. The museum opens to visitors daily from 8: 30 a.m. to 5 p.m., except on Mondays. This museum can be regarded as Sudan’s main custodian of the country’s historical heritage, for is where all of the collected ancient cultural material of Sudan is documented, kept and displayed for the benefit of all visitors. Sudan’s National Museum was established in 1971 at an attractive site on the Nile Avenue, overlooking the Blue Nile and not from its confluence with the White Nile. The museum consists of two main sections: The first is an outdoor garden of lush greenery, transgressed by a water channel symbolizing the Nile. Here, the monuments and temples of Napatan and Christian eras were reconstructed after their rescue from the flood caused by the construction of the Aswan Dam in the sixties. The second section is comprised of a two-story building, which accommodates a huge collection of rare archaeological artifacts. This covers all stages and epochs of Sudanese civilizations, from the early Paleolithic period through Napatan, Meroetic, Christian and Islamic areas. Of particular interest to visitors is the rare collection of artifacts belonging to the Kerma civilization (2500-1800 BC). The museum opens to visitors daily from 8:30 a.m. to 6:30p.m. Except on Mondays. Entry fees are Ls. 500. This was the residence of the Khalifa Abdullah Ben Mohamed, who succeeded the Mahdi. The ground floor of the residence was built in 1888 and the upper floor in 1891. It became a museum in 1928. The structure of the residence itself is of great historical importance, since it exhibits the style and architecture prevailing at that period. The vast collection of artifacts displayed inside the two-story museum covers almost the entire Mahdiya rule, apart from a collection of personal belongings of the Khalifa, such as utensils, beds, swords, spears and various other elements of everyday use. The museum opens to visitors daily from 8:30 Am. to 6:30 p.m. except on Mondays.